Lock in a great price for Bavaro Princess All Suites Resort, Spa & Casino - All Inclusive - rated 8.4 by recent guests. The staff I think It is the best thing in the resort everyone is super kind and helpfull. I want to say thanks to the 2 girls at the guest service that helped us to find the clinic for our sick friend. The rooms are comfortable and well furnished. The resort was beautiful. The gardens will well kept. Lots of birds roaming around which I really loved. The casino was the BEST at the Avalon Casino. The food was great. The coffee was delicious. The staff was great, always friendly and smiling. The beach was actually very clean and not many sea weed on that resort. The extra for the Platinium that we took was nice. The only thing I would say is don't leave any money anywhere. Before leaving for breafast I asked my husnband if I should leave the $5.00 that I have in my purse or should i put it in the safe. He laughed at me saying seriously no one will touch your purse. When I came back to my room the $5.00 were gone . After thatWe just didn't leave any money around no matter what amount. so that was a little bummer for me but other than that we had an amazing time! Amazing resort with plenty choices of activities, restaurants , the staff is friendly ! Nice beachfront, water and sand. The buffet food was better than other buffets I have had. - beach was beautuful and seawind was nice! -Chopin restaurant was EXELENT! -little car/train was nice when you are lazy :D - drinks were good! 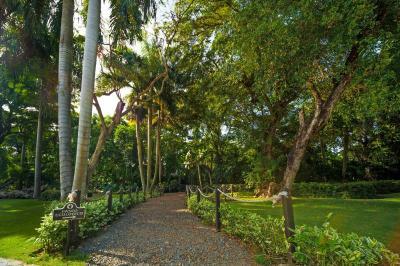 Extensive property with beautiful mangroves and beach. Large and comfortable rooms. The beach, the cocktails, the coconuts, and so many other! The room felt more like a house due to its size. And last but not least, Louis you where very helpful, and all employees try to help you and keep you happy! True hospitality! Easy to reach from Punta Cana airport.Nice estate,beautiful location near the ocean.Tasteful food in the restaurants,nice drinks&coctails.Kind welcoming in the platinium lounge. One of our bestsellers in Punta Cana! 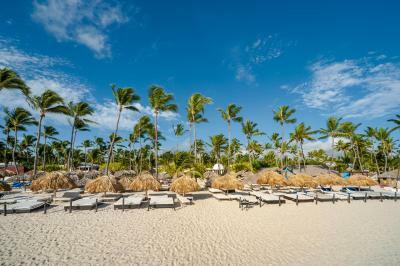 This all-inclusive resort is located on the beach in Bavaro In Dominican Republic. It offers 9 restaurants and 11 bars. Full-service spa and a 3 spacious outdoor swimming pools, including one for children, are available. Free WiFi is offered only in the front desk area. Guest suites at the Princess Bavaro offer a balcony and separate living areas. Cable TV and a fully stocked minibar are also included in each suite. Some have private hot tubs. All fully equipped suites are surrounded by preserved nature. 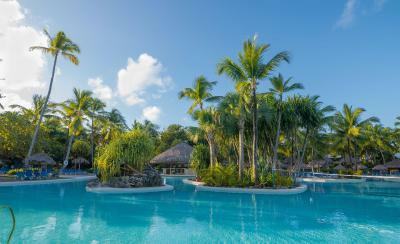 Bavaro Princess All Suites Resort, Spa & Casino features daily activities at the pool and beach area. Guests can use the hot tub or one of the 3 tennis courts. A fully equipped fitness centre is also available. Disco Legacy (Inside the Tower Princess Casino) with free admission and two national drinks from 11:00 pm to 1:00 a.m. Guest can enjoy the golf course 1.9 miles away from this hotel, which holds the 2016 Certificate of Excellence from Trip Advisor. Evening entertainment is available in the lobby at the Bavaro Princess. Free transportation to the nearby Avalon Casino is available. A nightclub and 3 bars are also open to guests. 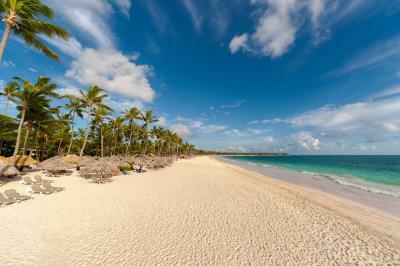 Punta Cana International Airport is a 25 minutes drive away while Cortecito and Los Corales beaches are 3.1 miles away. 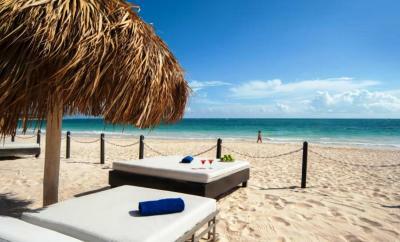 Bavaro Princess All Suites Resort, Spa & Casino - All Inclusive has been welcoming Booking.com guests since 17 Aug 2009. 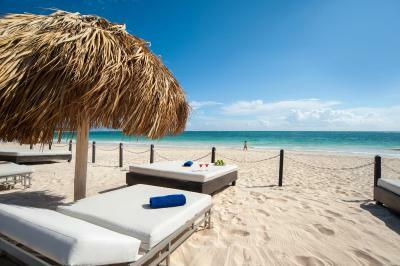 When would you like to stay at Bavaro Princess All Suites Resort, Spa & Casino - All Inclusive? This bungalow features 1 king-size bed or 2 single beds, air conditioning, safety box, ceiling fan, flat-screen cable TV, minibar, coffee maker and a bathroom with shower, spa bath and hairdryer. It also has a terrace, and the minibar comes with drinks. Ironing facilities are provided. This suite features a private hot tub, 24-hour room service, and private check-in. Guests in this suite will also receive one romantic dinner per person per week along with a souvenir photograph, one fruit basket per stay, a bottle of rum, special room decoration, an invitation to the Honeymoon Cocktail and late check out (depending on the availability). This suite features an en-suite bar and a 32-inch TV with DVD player. It includes private check in, Continental breakfast, 1 dinner at Licey restaurant, premium drinks, beach club with hammocks and waiter service, towels, bathrobes, slippers, special price for the spa, a 20-minute massage and full access to the Platinum Club Lounge. Free Wi-Fi is included only in the Platinum lounge private beach. The following services are only included in the room: free Wi-Fi, DVDs, 24-hour room service, international newspapers. This suite features a balcony, air conditioning, a spa bath, a safety deposit box and a minibar. 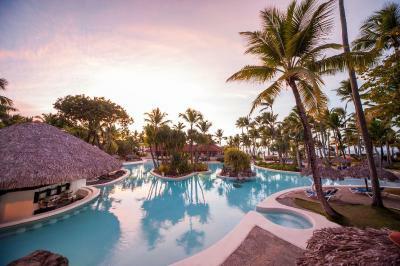 Hotel Bavaro Princess, situated in the Dominican Republic in an area renowned for its incomparable beauty, the quality of the sand and the clarity of the water on the famous Bavaro beach. Accommodation at this prestigious resort more than meets the expectations of the most demanding of customers. 168 splendid Platinum Suites, 32 Honeymoon Spa Suites, 82 functional Junior Suites, or the 556 spacious and fully equipped Bungalow Suites, provide the ideal added value to enjoy an unforgettable holiday. House rules Bavaro Princess All Suites Resort, Spa & Casino - All Inclusive takes special requests - add in the next step! 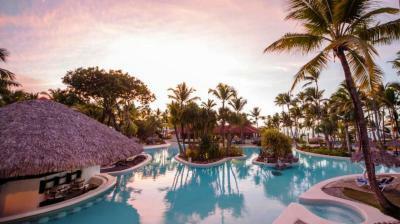 Bavaro Princess All Suites Resort, Spa &amp; Casino - All Inclusive accepts these cards and reserves the right to temporarily hold an amount prior to arrival. 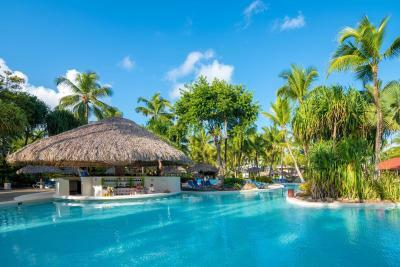 Bavaro Princess All Suites Resort, Spa & Casino - All Inclusive accepts these cards and reserves the right to temporarily hold an amount prior to arrival. Incidental Check Out: One night penalty for reservations of one week or less. Two nights penalty for reservations of more than one week. Maximum number of persons allowed per room: 3 adults and one child or 2 adults and 2 children. We were told there was a special breakfast for the following day after our arrival. They said if you are not outside at 8am you will miss the breakfast. We didn't care because since we were on vacation we had no intentions of waking up early. The next morning they called our room continuously until someone answered to tell us it was a mandatory breakfast. Woke up my 1 year old with the constant ringing. So I get the family ready. Come to find out it was to sell us a time share. After this, my expectations of the resort dropped dramatically. This ruined it for us. I dont like the staff lying about a welcome break fast just to talk about the program, they take 90 minutes of my time. The food was terrible. The online pictures were very deceiving. The drinks were watered down. Not a good experience. The room was full of cockroaches for the whole stay of 9 days. The staff did not do much. The food at the buffet could’ve been hotter. I always felt like I was eating cold food. Also guests need to smoke outside and not in the lobby. The smoking was very disturbing. And there needs to be more activities if it rains because it rained two entire days during my stay and it was very boring! I liked the staff they were friendly. Also the food at the restaurants was pretty good. Like the beach and the staff was very helpful and nice. Room could definitely use an updating. There were bugs, however, I do realize we are in such environment, this can not be avoided. Food was pretty basic, we knew that, and didn't mind it. Even at the "a la cart" restaurants- same food as at the buffet, only served as a "plated meal." Even though we upgraded to "platinum" we still had to ask for the "good" alcohol haha drinks were weak, like barely any alcohol in them - but can you imagine how bad it would be if they were full strength and people drank all day ?!? Too funny though:) My biggest issue of all was THE INTERNET! forget about getting service anywhere besides the "platinum lounge"
The staff was absolutely amazing- so friendly, smiling and helpful in any way possible. Beach was so beautiful, it truly felt like paradise. Pool was clean and big. plenty activities, fun for the kiddos. Our room was made twice a day! I loved that. Fresh fruit is what we were very excited about- and there was plenty of it everywhere! First of all the food is just ok, I would pay attention to the meat a friend of mine felt really bad . Rooms are too humid and cold. There is not water sport you can do, only things they do is beach volley. There is no night animation. There are only family and old people so if you are a group of young people take something else. The fact that someone took from my purse money.